Very simply, VoIP is sending telephone calls over the Internet. It stands for "Voice over IP". VoIP can dramatically reduce your telephone costs. 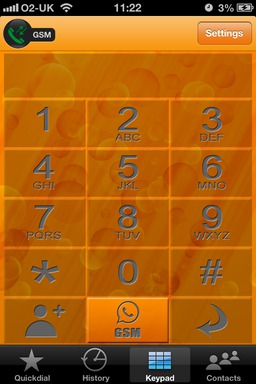 Utilising a VoIP SIP connection over the Internet, you can connect to your telephone service, entirely free of connection charges, from anywhere in the world. As long as you have access to a reasonably good Internet connection, you can log in from anywhere on Earth and receive your calls just as if you were sitting at your office desk, for just 1.75 pence per minute - even if you're using our VoIP client on your mobile phone! You can also place calls at UK prices, regardless of where you are. Data charges may apply for mobile use, depending on your mobile package. Purchase any telephone number from Switch. In the SwitchINS portal, purchase the "VoIP Upgrade". There is a one-off £10+VAT set up charge. 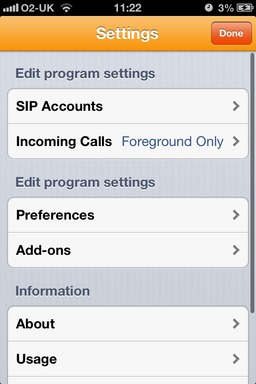 Download and install the Switch VoIP App, detailed on this page, or use any other SIP-capable softphone or SIP telephone. 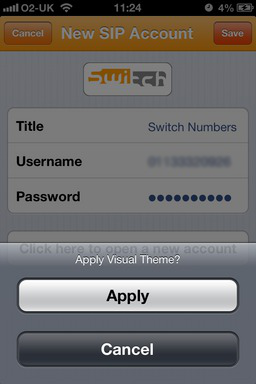 Enter your username and password in your app or phone, and start using the service immediately! Download and install the App from the Android Market or Apple App Store. 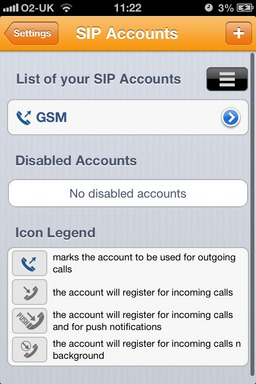 Once it's running, tap "Settings"
On the "Settings" screen, tap "Sip Accounts"
Find "Switch Numbers" in the providers list. If necessary, select the "Sort By Name" option to obtain an alphabetical list, and scroll down to "S" to find us. Purchase the VoIP upgrade for the one off £10+VAT admin charge. You will then be given VoIP login details with no monthly fee to pay, and you can use the VoIP service to receive calls to your number with no call charges to you, regardless of where you are! As long as you have a reasonable Internet connection, you can receive your VoIP calls for free, even on the other side of the world. 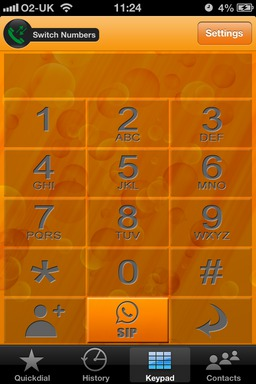 When prompted to apply the Visual Theme, tap "Apply" and then tap "Done"
Your VoIP service is now ready to use! You should see a green icon in the top left corner with the name of your service, indicating that your line is registered and ready for use.